I know what you were thinking when you woke up this morning. You were wondering….. 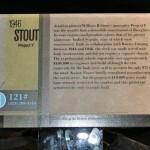 The answer to your question is….the “1946 Stout Project Y” – also called “The Stout Forty-Six” designed by William B. Stout and built by Owens-Corning. 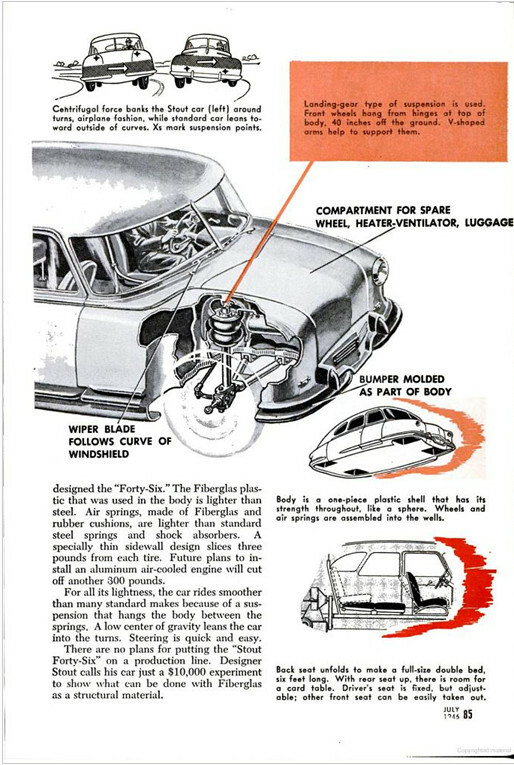 Popular Science, July 1946 Caption : The body of this car, designed by William B. Stout, together with the bumper and a few structural parts is made of fiberglass bonded with synthetic resin. News writers, invited to hit the body with hammers, found they could not dent it. 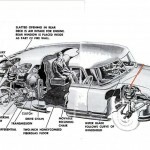 Shown wight are cross sections of the bumper and a hollow strut that attaches the engine to the body; also a cut-away piece of the fiberglass honeycomb material that is used to make the interior of the strut. 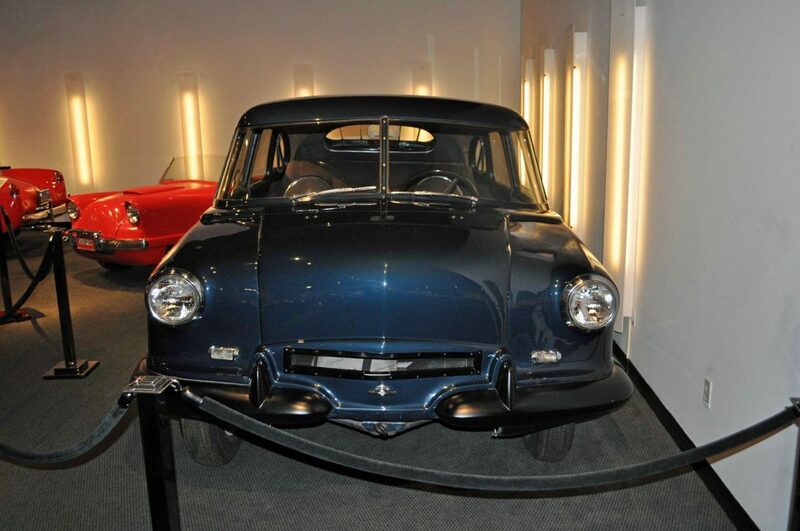 I had a first hand chance to see the Project Y fiberglass car when it appeared in the “Fantasies in Fiberglass’ exhibit at the Petersen Automotive Museum in 2010. Click here for more information about that show. 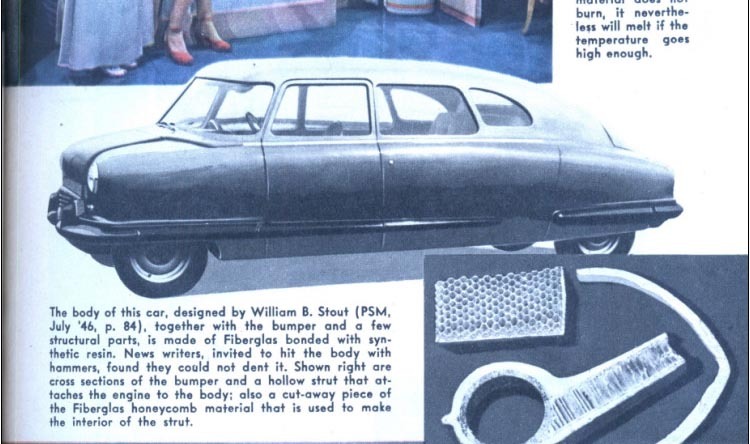 The “Stout Forty-Six” is not what we typically think of as a fiberglass car. It’s not even a sports car – it’s a coupe. Maybe even more of a teardrop car like the original Stout Scarab that William B. Stout built back in the 1930’s. More about that in a bit. 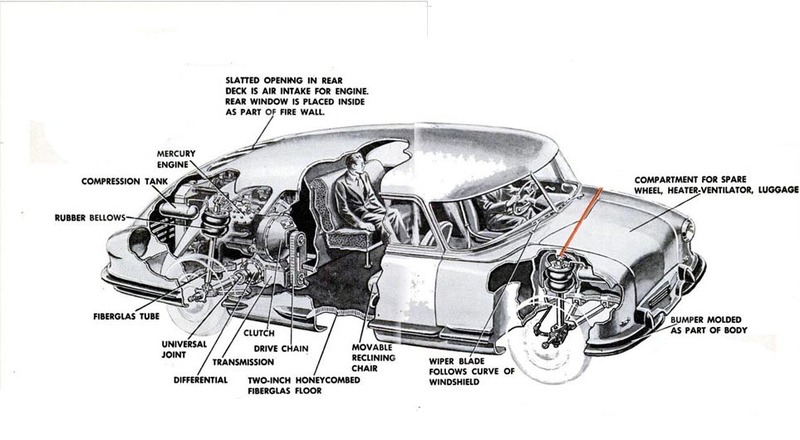 What makes this even more interesting is that Stout designed the car with a unibody or monocoque chassis. 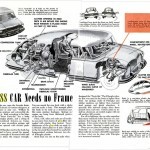 The car body and floor structure was the frame. Stout was a visionary when he considered how fiberglass could be used. 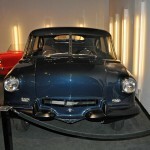 Side Shot of 1946 Stout Project Y at The Petersen in 2010. 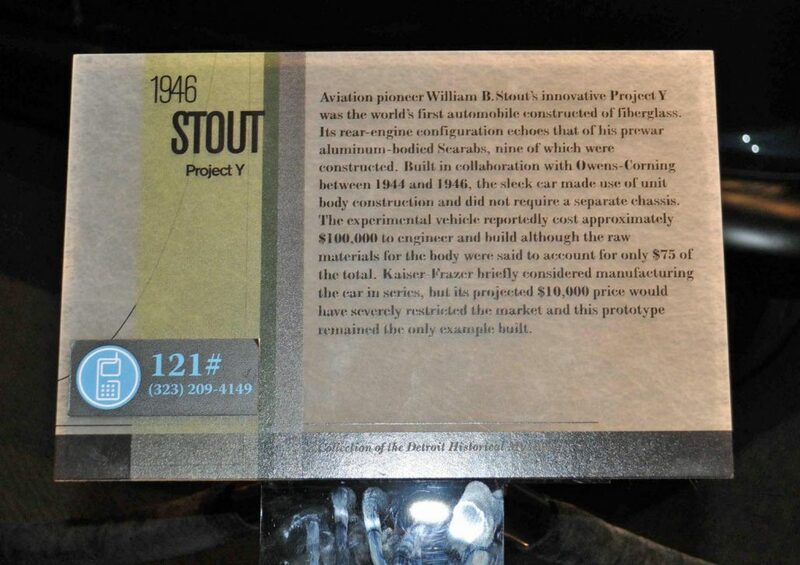 1946 Stout Project Y: Aviation pioneer William B. Stout’s innovative Project Y was one of the world’s first automobiles constructed of fiberglass. Its rear-engine configuration echoes that of his prewar aluminum-bodied Scarabs, nine of which were constructed. 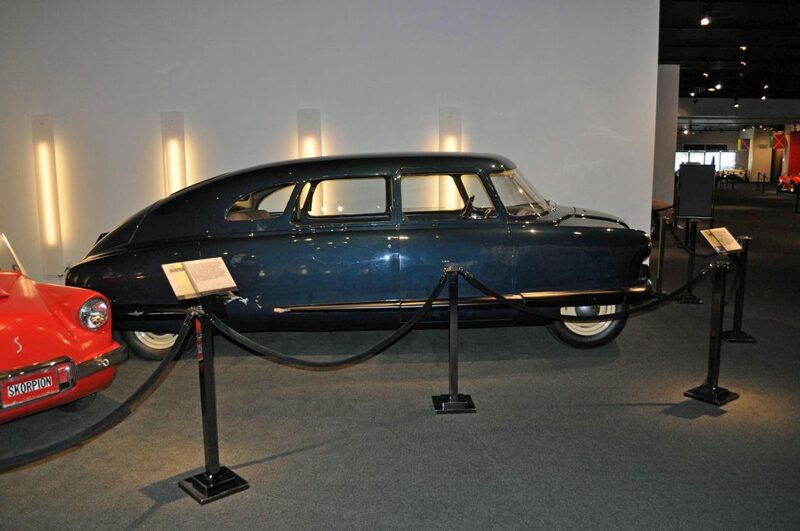 Built in collaboration with Owen-Corning between 1944 and 1946, the sleek car made use of unit body construction and did not require a separate chassis. 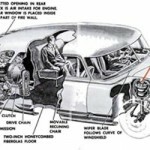 The experimental vehicle reportedly cost approximately $100,000 to engineer and build although the raw materials for the body were said to account for only $75 of the total. 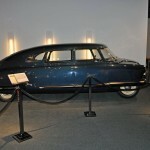 Kaiser-Frazer briefly considered manufacturing the car in series, but its projected $10,000 price would have severely restricted the market and this prototype remained the only example built. Front Shot of 1946 Stout - Not a Bad Design For The Time, and Great Visibility Thru Those Massive Windows. Anyone See A Skorpion or Woodill Wildfire Lurking Behind the Stout??? 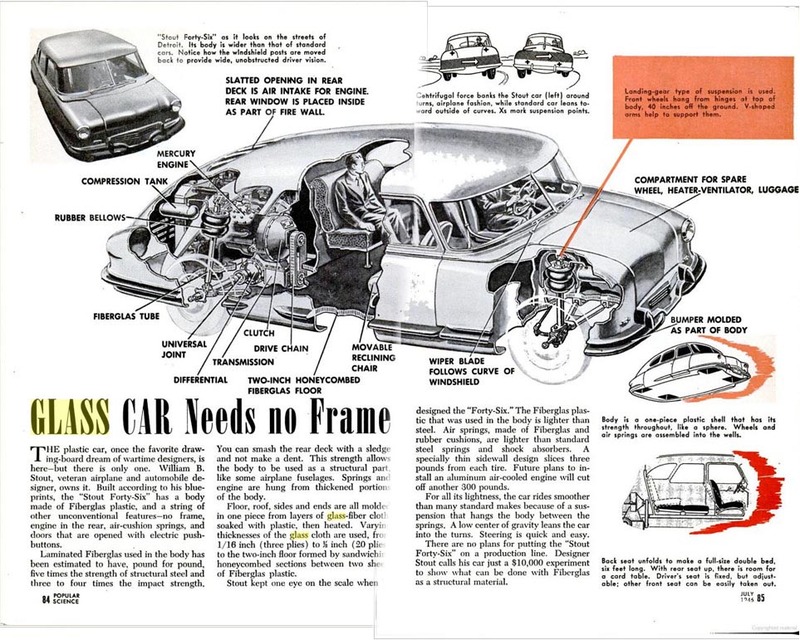 The plastic car, once the favorite drawing-board dream of wartime designers, is here – but there is only one. 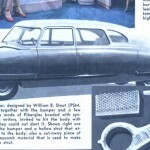 William B. Stout, veteran airplane and automobile designer, owns it. Built according to his blueprints, the “Stout Forty-Six” has a body made of fiberglass plastic, and a string of other unconventional features – no frame, engine in the rear, air-cushion springs, and doors that are opened with electric push buttons. Laminated fiberglass used in the body has been estimated to have, pound for pound, five times the strength of structural steel and three to four times the impact strength. You can smash the rear deck with a sledge and not make a dent. This strength allows the body to be used as a structural part, like some airplane fuselages. Springs and engine are hung from thickened portions of the body. Floor, roof, sides and ends are all molded in one piece from layers of glass-fiber cloth, soaked with plastic, then heated. Varying thicknesses of the glass cloth are used, from 1/16 inch (three plies) to ½ inch (20 plies) to the two-inch floor formed by sandwiching honeycombed sections between two sheets of fiberglass plastic. Stout kept one eye on the scale when he designed the “Forty-Six.” The fiberglass plastic that was used in the body is lighter than steel. Air springs, made of fiberglass and rubber cushions, are lighter than standard steel springs and shock absorbers. A specially thin sidewall design slices three pounds from each tire. Future plans to install an aluminum air-cooled engine will cut off another 300 pounds. For all its lightness, the car rides smoother than many standard makes because of a suspension that hangs the body between the springs. A low center of gravity leans the car into the turns. Steering is quick and easy. There are no plans for putting the “Stout Forty-Six’ on a production line. Designer Stout calls his car just a $10,000 experiment to show what can be done with fiberglass as a structural material. The name of the car is interesting. 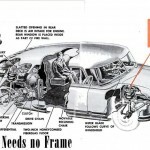 Owens-Corning most likely gave the car the name “Project Y” when in-house, while Stout called it “The Forty Six” most likely named for the year in which it debuted. 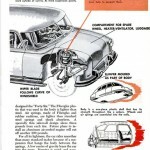 Today it’s mostly known as Stout’s Project Y fiberglass car. But gang….there’s a car lurking out there for you to find. 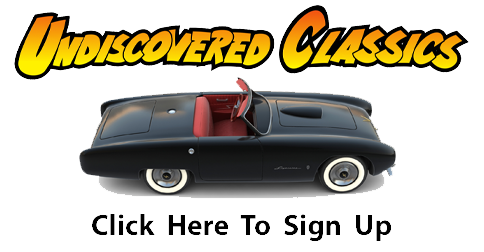 It’s the missing fiberglass 1941 Ford concept car. Rumors are that it was destroyed but you know better. Maybe someone near Detroit like Stan Fowler (are you reading this Stan?) will find it. 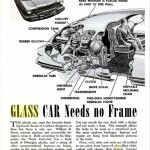 How ’bout some of our other Forgotten Fiberglass friends in Michigan? Are you up to the task??? When I was doing my research for my article on the front page of the Feb. 1980 Machine Design magazine re my concept for a 3 piece modular injection-molded car structure and all those concepts which preceded mine, I took a look at the Stout which was in a small Detroit museum separate from the Henry Ford main one. I was amazed to see what looked essentially like a McPherson strut rear suspension, topped by an airbag spring! Stout was way ahead of his time with his honeycomb concept. 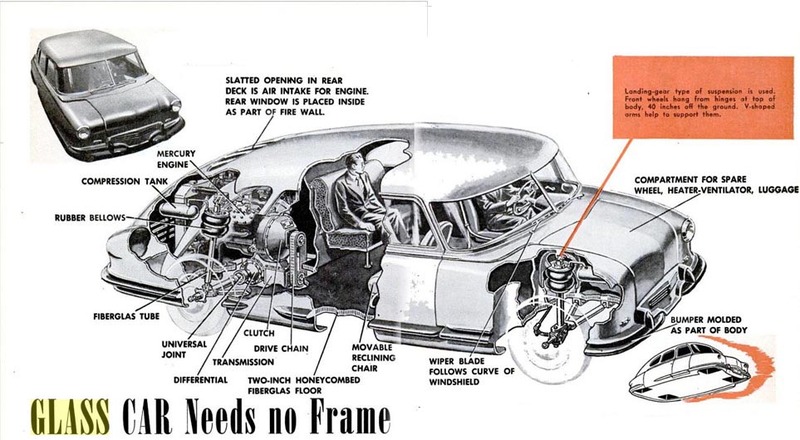 The car itself did seem to have a minimal internal steel tube framework, but it’s been so long that I don’t remember very well how “structural” it was. I didn’t realize at the time that it was a true honeycomb construction. 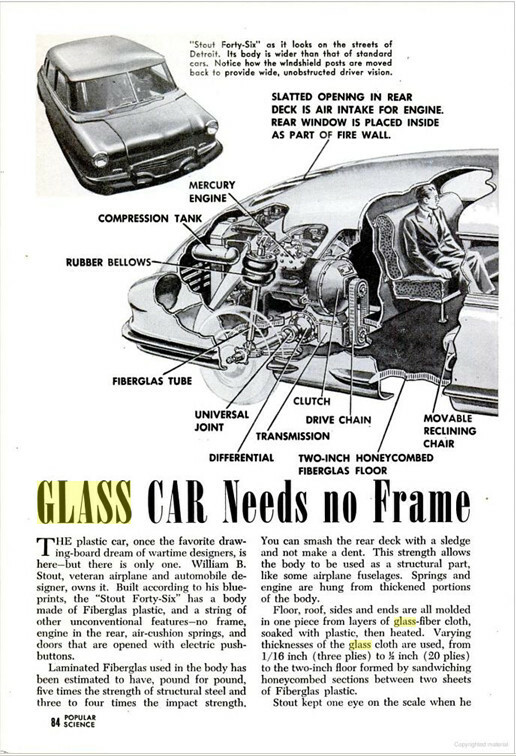 time for me to take another look at that car or my article, which included a photo of the Stout…..
Sr. Technical Consultant – Dupont Engineering Polymers – ret’d. Front Shot of 1946 Stout – Not a Bad Design For The Time, and Great Visibility Thru Those Massive Windows. Anyone See A Skorpion or Woodill Wildfire Lurking Behind the Stout??? ANYONE KNOW WHERE THIS CAR IS NOW. I live in Australia and would like to have photos of any fibreglass cars with information about them. I especially would like old photos or newspaper articles from overseas. Geoff, hi! It’s your old podcast pal Todd Ruel here. I just bought a beautiful Kodachrome home movie of the Stout Scarab Forty-Six/Project Y. The Kodak film codes date the film to 1945. It’s silent, and it shows a group of men (maybe the design/engineering team?) and then the Forty-Six driving up to the camera. It also shows the Scarab parked. I haven’t viewed the rest of the film, but it’s all gorgeous Kodachrome home movie footage. It’s about 250 feet. It was definitely shot by someone involved with the project. I’ll share it with you when I get it digitized. I was at the Gilmore Car Museum at Hickory Corners, MI today and took a picture of the 1946 Stout on display there.